Have you been to Cambodia? What would you consider as its top attraction? I am sure you would agree with me that the best of Cambodia are not just places. Once a great empire, it doesn't lack monuments. But what visitors enjoy most and I'm sure you did as well are its simplicity of life and the goodness of its people. ​Buddhism is at the core of life in most of Cambodia, in particular, among the Khmer. Buddhist temples dot the place and in many rural areas, those are the centres of life in the village. 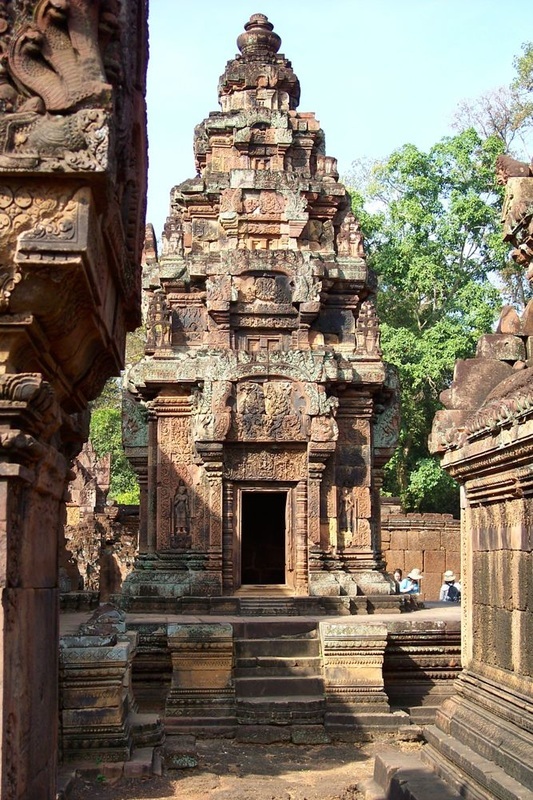 ​Most of the important ceremonies and events in Khmer life start with a visit to the temples. It is not unusual to see Buddhist monks in the streets especially in the morning when they go around to beg. Cambodia's Angkor Wat and the other Angkor temples are spectacular. You can spend days exploring the interesting ruins and imagine the complex life lived there before. Another heritage site is Preah Vihear with its temples on the hill, monuments to the great builders of Angkor. Although the Pre-Angkorian ruins are not as impressive as the Angkor Wat and the other temples in Siem Reap, they are just as interesting. Some of these temples are within easy reach from Phnom Penh or Siem Reap, the usual international gateways for tourists flying into Cambodia. Others, though, can only be reached during the dry season. Recently, on a work trip to Kampong Thom, the school I was visiting was right in the vicinity of the ruins of Sambor Prei Kuk before known as Isanapura, one of the centers of the Chenla Kingdom which flourished around sixth century. This trip took me about two and a half hours drive from Phnom Penh. 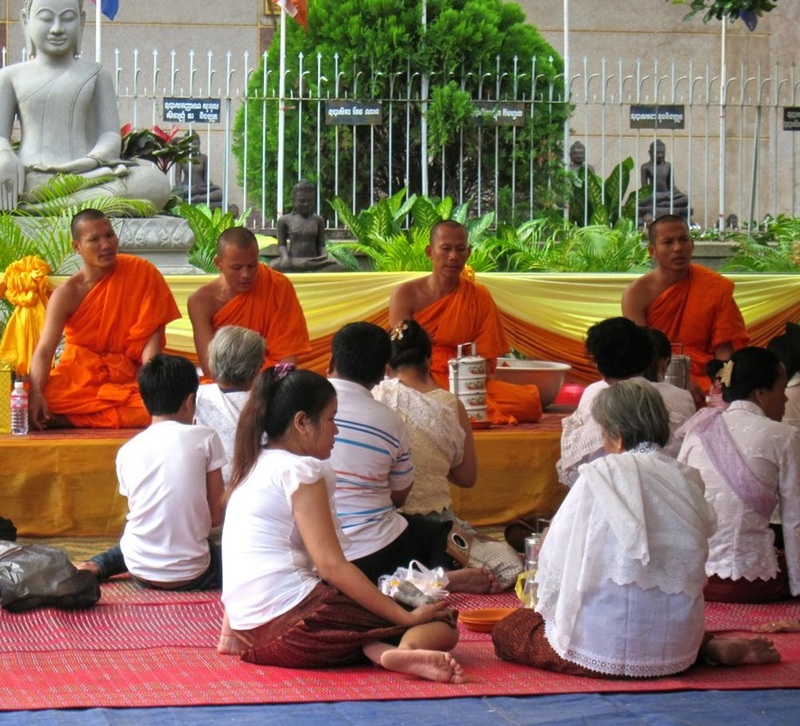 The Khmer (Buddhist Cambodians) celebrate New Year around mid-April. At this time, the Khmer acknowledge the achievements of the past year and welcome the future. Moreover, this is the time to show gratitude to their parents, grandparents, and the spirits of deceased relatives. This is also the time to wash away all negative thoughts of jealousy, malice and revenge and to promise to live the five Buddhist rules of conduct: do good deeds of mercy, compassion, sympathy, fairness and wisdom. A 3-day celebration, there are offerings of candles, incense sticks, fruits, flowers, banana tree trunk with layers of banana leaves, coconut and water to the New Year Angel and also food to monks to receive blessings and gain merit. It is believed that the New Year Angel will bring good luck, prosperity, good health and happiness to those who prepare well. In 2015, the New Year Angel was the third daughter of Kabil Moha Prum, Reakyasak Tevy and she came on the 14th of April at 2:20 p.m. Khmer prepared her favourites which included watermelon, pineapple, ripe mango, orange, grape, Burmese grapes, dragon fruit, sapodilla, banana and coconut. And, of course, flowers, incense and candles. The 2015 celebration was in Siem Reap, Angkor Sangkranta, where the Prime Minister and the head of the Opposition Party joined to welcome the New Year. The festival included a 3.2 ton sticky rice cake aimed for the Guinness of World Records, an enormous wooden filter used to make Prahok (fermented fish paste) and a Madison line dance of 2,015 dancers. This is the Cambodian traditional way of predicting weather, farming conditions and possible calamities. After the Royal Ploughing procession the oxens are led to seven golden trays containing rice, corn, sesame seeds, beans, grass, water and wine. The fortune of the year ahead depends on which tray the oxen choose. Cambodians await the predictions resulting from this annual ritual and still hold strong faith in these. During this festival, the Khmer celebrate the change in the flow of the river and thank the river for a good harvest. In Phnom Penh, rural folks come with their village boat and rowers and compete in the boat race which lasts for 3 days. During Pchum Ben, Khmer go to the temple and bring offerings for their dead relatives. Cambodia's pristine beaches dotting the Gulf of Thailand can be enjoyed in Kep, Koh Kong and Sihanoukville. Kep used to be the beach town of Cambodia during the colonial times so colonial houses still line the city but now Sihanoukville has become the beach destination. Koh Kong is on the sea but its beaches have not really been developed. 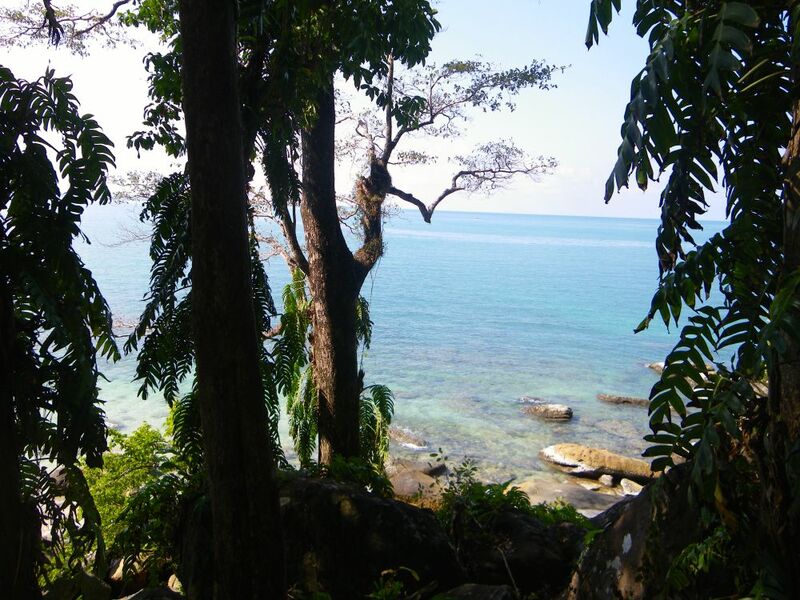 Sihanoukville has several beaches to boast about: Oucheutel, Serendipity, Victory, Otres, Independent, Sokha and the beaches in the surrounding islands. You can go kayaking, snorkeling and diving. Oucheutel, Victory and Serendipity are very alive with all the restaurants, bars, hawkers selling all kinds of food and trinkets. Otres beach is more quiet. The best are the beaches at Sokha and Independence Hotel as well as the newly developed islands where one can enjoy privacy and luxury. Worth the price. 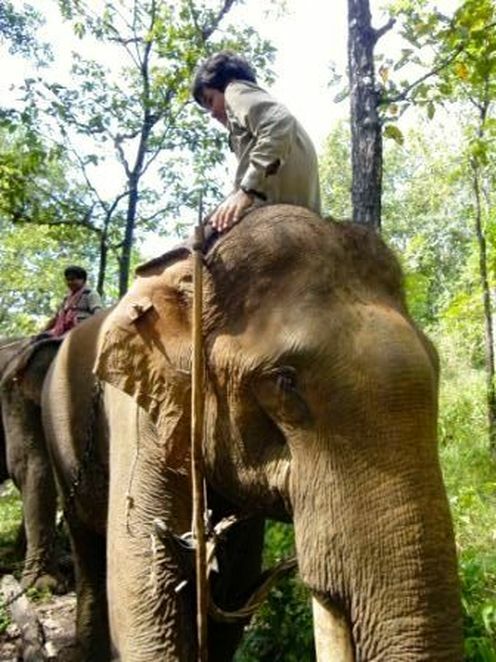 These two places in Cambodia offer national parks where with a guide you can enjoy jungle treks or elephant ride through the jungles. Here, you can enjoy Cambodia's best waterfalls and meet some of Cambodia's ethnic minorities. Closer to Phnom Penh, you can trek in Bokor Mountains. This used to be another favourite for the French. On top of Bokor, the breeze is cool, a respite from the heat of Phnom Penh or Kep. Bokor is an easy drive from Kep for those who want to have a break from the ocean. The road leading up is now very good and development is going on for hotels. As you go up, you can stop at various places to see ruins of old royal cabins, old Catholic Church and an old French hotel which is now being renovated. My favourite is the Buddhist temple there where one can get blessing from the monks and worship with the others as they light their sticks and offer prayers. This is Cambodia's first national park. A day's drive from Phnom Penh, it is a popular place for locals to spend time and enjoy hiking and bathing in the water falls. Cambodia has already achieved listing for some of its traditional heritage with the inclusion of Sbek Thom (shadow puppet theatre) in the UNESCO Intangible Cultural Heritage List. Another one, often performed at weddings or Khmer New Year, is the "ayai", a traditional art form in which two people pitch their wits at each other through song. There is also the "kbach kun boran Khmer", a traditional way of Khmer boxing. Other traditional objects Cambodians are proud of are their "chapei dong veng", a two stringed instrument with a wooden body and long neck and "hol phamuong", their traditional dress made from silk. Enjoy savouring the varied flavours, both familiar and "what is that?" of the local cuisine. 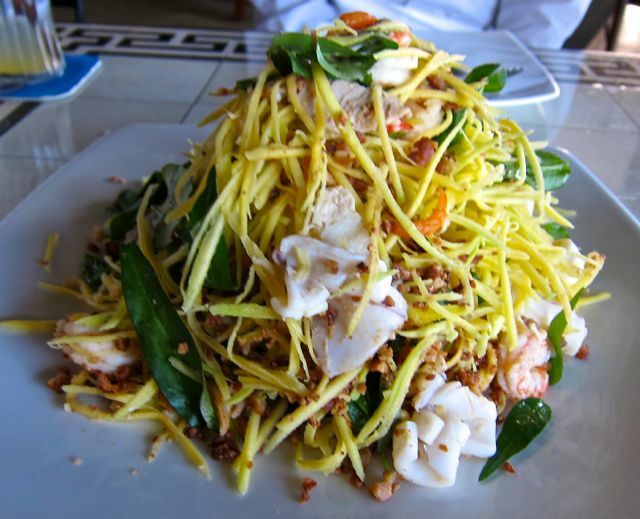 Everyone knows Thai food and Pad Thai is now on almost every menu in the world but what about Cambodian food? 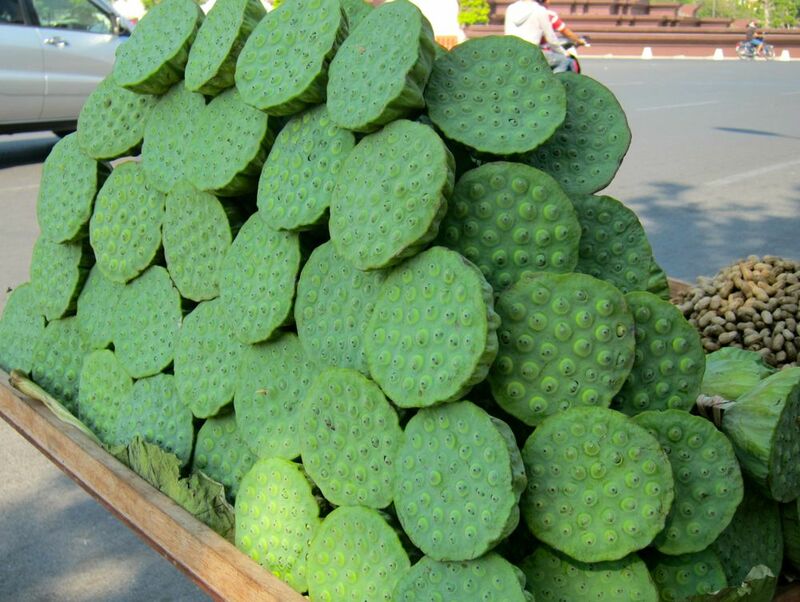 Many think that because Cambodia is close to Thailand, Laos or Vietnam, the cuisine will be the same as these. Or, some think that by being part of the old French IndoChina, Khmer cheffery is closer to French cooking. These are partly true but Cambodian cuisine is truly unique unto itself. They have crafted their own cuisine from all these influences including in the far distant past the hints of India. But the biggest single cuisine driver is the abundance of fresh and sea food and the fresh produce. The flavour is derived from spices and aromatic herbs such as galangal, tamarind leaf, turmeric, kaffir lime and lemon grass which they pound into a paste. They usually garnish generously with coriander, chives, heartleaf, basil or mint which they grow or purchase fresh from the market. ​The ingredients they use are usually cultivated around their homes or foraged in the fields or the wild which include rice paddy herbs, wild roots or sour leaves and, of course, their favorite snacks such as field roaches, spiders, sparrows and locusts. As there is an abundance of both fresh and salt water fish which the Cambodians salt, dry, and ferment, their cooking always include prahok, a fermented fish paste added to almost anything. Their use of this, though, is more sparing, just enough to give the dish a distinct flavour, uniquely Cambodian. In addition, as most grow their own vegetables, the local Cambodians add generous portions of vegetables to their cooking including banana and squash flowers, chive flowers, morning glory, bamboo shoots, lotus flowers, indigenous green leaf vegetables. ​Cambodian cuisine seems to be a delicate balance in sweetness, sourness, bitterness, spiciness and saltiness and the taste of aromatic herbs put it all together into a delight for the palate. By the way, pepper from Kampot, one of Cambodia's provinces, has graced Parisian restaurants since the 1900s. You can try Cambodian food in many restaurants but go to the local eateries as well to taste the more authentic flavour. Cambodia went through a very sad time in its recent history under the Khmer Rouge. Read this book to have a glimpse of the life the Cambodians lived at this time.